This course will teach you how to identify frogs, toads, newts, lizards and snakes and show you techniques you can use to survey these animals. The course is free and suitable for people of all ages and levels of experience. So why not come along and see how you can help protect London’s dragons! Where: Basement room of the Temple, Wanstead Park, London, E11 2LT. When: Saturday 9th April 2016 between 10:00 and 13:00. On a warm Tursday evening on 17th June 2015 the annual WREN Wildflower Walk took place in the Exchange Lands adjacent to Wanstead Park with about 30 walkers. As always when such a walk is led by someone as knowledgable as Tricia Moxley it was both interesting and informative. To a background of birdsong, Chiff Chaffs being particularly vocal, she led us from the Riding Stables on a circular route through the area pointing out and discussing the common (e.g. 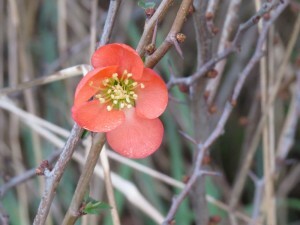 Bramble, Mallow, Dog Rose), the pretty (e.g. 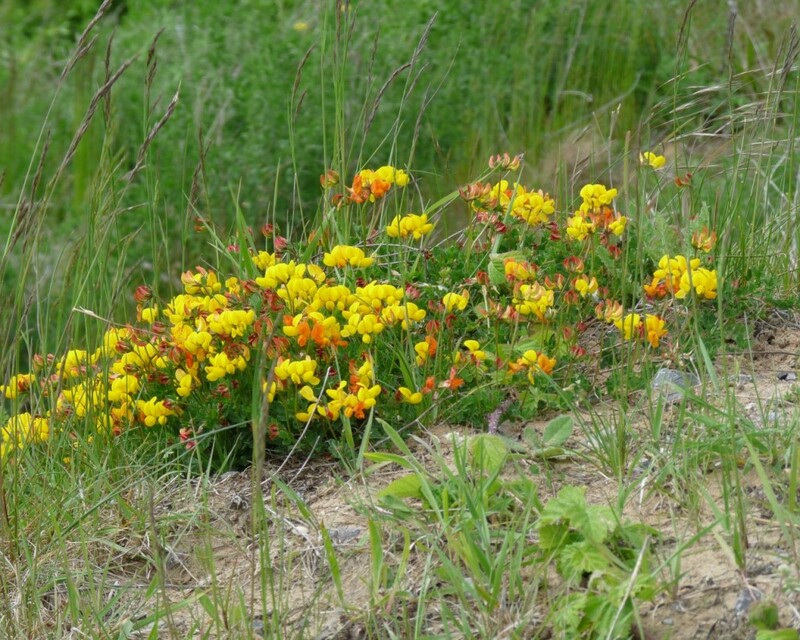 Creeping cinqfoil, Everlasting Pea) and the ominous (e.g. Hemlock, Giant Hogweed). Finishing appropriately for an old sewage works with Biting Stonecrop. 21:00. Bat Walk. Meet outside the tea hut, Wanstead Park. 22:00. Moth-trapping. Meet outside the Temple, Wanstead Park. Several local moth enthusiasts will have their light traps fired up to attract some of the great array of moths to be found in Wanstead Park, hopefully including a hawkmoth or two. Bring a torch and wear appropriate clothing for an evening activity. Duration: approx. 3 hours, so you can do the bat walk and then look at the moths! 10:30. 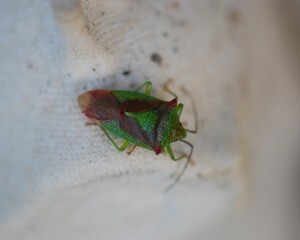 Wanstead Flats Wildflowers and Bugs. Meet at the Centre Road car park, Wanstead Flats. Local botanist Tricia Moxey will lead a walk through the site of special scientific interest to the west of Centre Road in search of the area’s special wildflowers, insects and other invertebrates. Hopefully a grasses expert will also be on hand to point out the amazing variety of grasses in the area. Duration: approx. 90 minutes. 11:00 to 15:00. Wanstead Flats Grass-sweeping. Near Centre Road car park, Wanstead Flats. Join Dr Tristan Bantock and his team of insect specialists as they scour the grasslands for day flying moths, beetles, flies, weevils and other invertebrates. Expect some unusual finds. Duration: several hours. 14:00. Wanstead Flats Larks and Butterflies. Meet at Centre Road car park, Wanstead Flats. Local naturalist Gill James will lead a walk through the unmown section of Wanstead Flats in search of singing Skylarks, grassland butterflies and wildflowers. Hopefully a grasses expert will also be on hand to point out the amazing variety of grasses in the area. Duration: approx. 90 minutes. 05:00. Dawn Chorus Bird Walk. Meet outside the tea hut in Wanstead Park. Leading birder Nick Croft leads the crack-of-dawn walk around the park to listen to the sounds of the dawn chorus, see a new generation of young birds and maybe encounter a surprise or two. Duration: approx. 2 hours 30 minutes. The tea hut will open specially for refreshments at 07:30. 11:00 to 15:00. Children’s Art Installation, Nature Table and Quiz Trail. Outside the Temple in Wanstead Park. 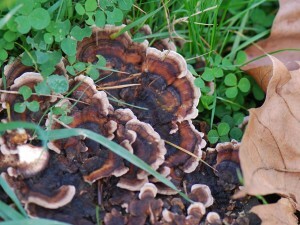 Fun, and some challenges for younger nature enthusiasts. There will also be an opportunity for children and adults to enter their nature photographs for a photo gallery. Young children should be accompanied by a parent or carer. 11:30. Wildflowers and Trees of Wanstead Park. Meet outside the Temple, Wanstead Park. Tricia Moxey will lead a walk around the park to learn about some of its special trees and wildflowers. Duration: about 90 minutes. 11:30. Pond-dipping in Shoulder of Mutton Pond. Meet outside the Temple, Wanstead Park. The park’s lakes hold a surprising amount of aquatic life, from large fish to tiny invertebrates, including dragonfly larvae. Watch Derek McEwan as he catches an endless array of life-forms from the Shoulder of Mutton lake. Duration: about 90 minutes. 14:00. Pond-dipping in Alexandra Lake. Meet outside the Temple, Wanstead Park. 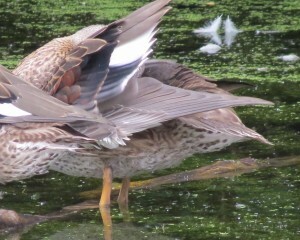 Derek shifts his pond-dipping activities from the park to Wanstead Flats. Duration: about 90 minutes. 14:00. Wanstead Park Butterfly and Wildflower Walk. Meet outside the Temple, Wanstead Park. Mark Thomas, ably assisted by Kathy Hartnett, wander around the park in search of butterflies, flowers, dragonflies and more. Duration: about 90 minutes. Half a dozen Wren members visited the Buglife reserve of Canvey Wick on Sunday 17th May. 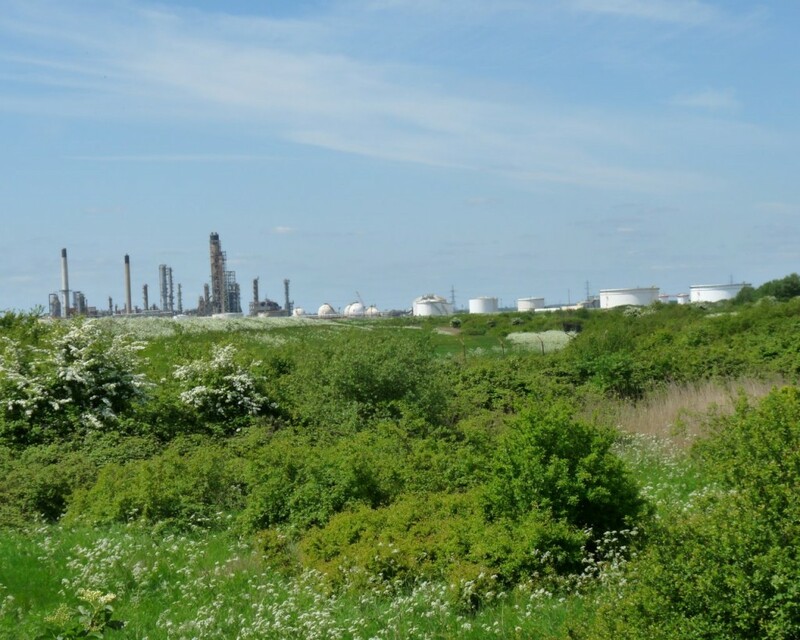 This brownfield site was going to be developed as a refinery, but the development was never completed and it is now reverting to a more natural state. 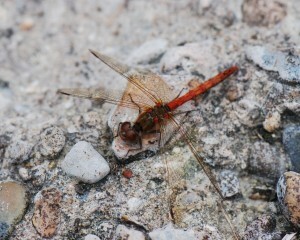 We were blessed with sunny, dry weather, though the fresh breeze probably suppressed some flying insect activity. Over a hundred species were noted, including 50-odd species of plants (listed below), some of which are not familiar in the Wanstead area. Mary Holden found one of the day’s highlights: several Great Crested Newts in a ditch, which we were able to watch while we were having our lunch. Large Red Damselflies and at least one Hairy Dragonfly also frequented this ditch, with Azure Damselfly being seen nearby. Parts of the site are very sandy and it was in one such area that two Latticed Heath moths were found, with a frustrating glimpse of a passing butterfly that I suspect was a Wall in the vicinity. Several other butterfly species included Green Hairstreak. Paul identified a specimen of Canadian Fleabane growing on a sandy hill; this was a plant must of us had never noticed before. Although not in flower, the presence of good numbers of Common Spotted Orchids was also exciting. A few Barn Swallows were seen, although it wasn’t clear whether these were birds nesting nearby, or late migrants passing through. A pair of Cuckoos remained all the time we were there; given the number of Reed Warblers (a host species) singing in the Phragmites-lined ditches, they may be tempted to stick around. Thanks to Paul for resolving many identification conundrums, for Kathy for compiling the list and taking the photographs, and for Pam, Mary and Gill for their keen eyes and good company. 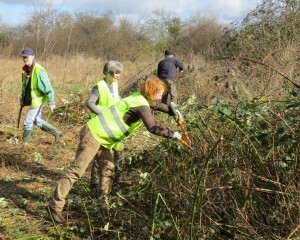 A bright, sunny morning with a blustery wind saw a dozen Wren volunteers clearing bramble scrub in the Exchange Lands, between the River Roding and the City of London Cemetery. We do this activity every year to maintain the balance between grassland and scrub in the area. Both habitats are important habitats for insects and birds, but left unmanaged the whole area would become covered with brambles and we would lose the grassland wildflowers, several butterfly and moth species and birds such as Green Woodpecker. This was the last weekend practical work of the winter; birds are now starting to nest and we want to avoid disturbance. 3 species of freshwater leech (subclass Hirudinea). 1 species of horsehair worm (phylum Nematomorpha). 12 species of molluscs, including a variety of freshwater snails and mussels. 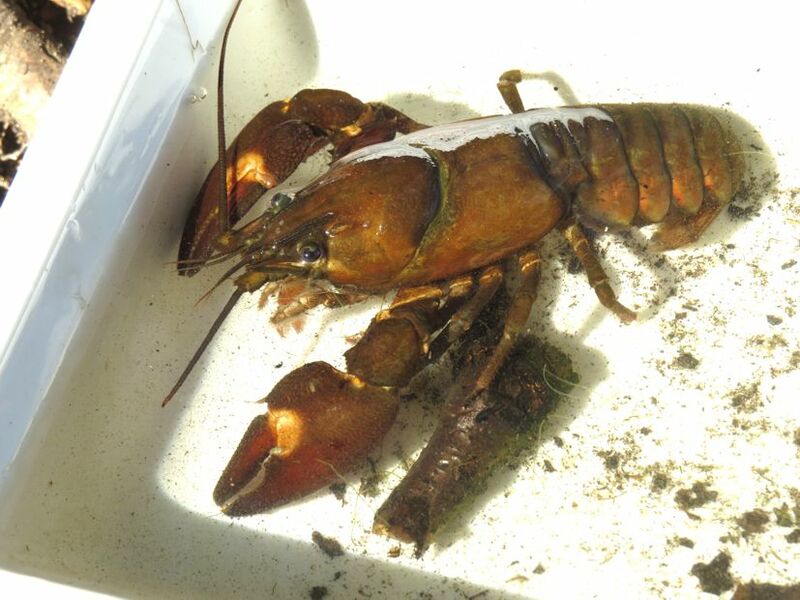 2 species of crustaceans, the most dramatic of which was a large American Signal Crayfish. 1 species of true fly (order Diptera). 9 species of water bugs, the most common being Greater Water-Boatman, and with four species of Lesser Water-Boatman. 6 species of water beetle, including the fascinating Screech Beetle (Hygrobia hermanni), which let out an audible squeak when touched. 6 dragonfly and damselfly species, including the larvae of Common Blue Damselfly and Red-eyed Damselfly; there was also a very late flying Black-tailed Skimmer. 2 fish species, Perch and Roach. The Wren Group is preparing plans to do more bio-blitzes in 2015. Watch this space! The day dawned frosty, but with hardly a cloud in the sky by 10am it was warm and sunny as people assembled in Wanstead Park for the Wren Group’s first bio-blitz. The Lakehouse moth-trap had already delivered nine species of moths, and the efforts of Bob, Dan, Debbie and Tim had produced a good selection of birds on Wanstead Flats, including a party of Skylarks that had deserted their breeding area and returned to their winter feeding quarters – on the other side of Centre Road! Other birds found on the Flats during the day included a Stonechat and Linnets, but there was no visible migration of note. Back at The Temple, after a showing of four of the moth highlights – Black Rustic, Shuttle-shaped Dart, Pink-barred Sallow and Lunar Underwing – Derek took charge of the pond-dipping session in Perch Pond, while Gill, Cathy and Jackie led a group listing invertebrates, plants, lichens and fungi in Chalet Wood. David scoured the Park for birds, while Rose went off in search of anything of she could find. A large Signal Crayfish and several Perch ended up in pond-dippers’ nets and four species of dragonflies were seen over and around Perch and Heronry, including a very late Black-tailed Skimmer. 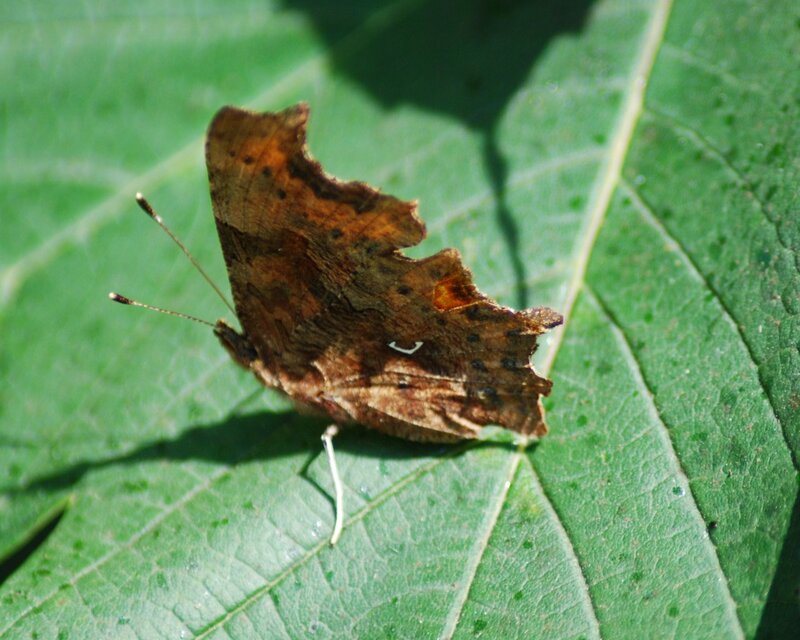 Good numbers of Red Admiral butterflies, along with a few Large Whites and Speckled Woods – and a lovely, fresh Small Copper – were on the wing over The Plain. Cathy picked up a Buzzard soaring over The Glade and a few minutes later it drifted south over The Plain. Unusually these days, both Treecreeper and Nuthatch were recorded: Cathy heard the latter calling in Chalet Wood, while Dan saw a Treecreeper in Bush Wood. A selection of interesting aquatic invertebrates was showcased at The Temple. These included an extraordinary squeaking water beetle, probably Acilius sulcatus, and a Great Water Boatman, Notonecta glauca. As the afternoon wore on, people were still trying to add new species but we called it a day at 3pm. With various people working on the identities of mystery bugs and lichens, we hope to have a comprehensive list in a few days’ time. My hunch is that we’ll top 150 species for the day. Thanks to the City of London for letting us have use of a room at The Temple, and thanks to the 30 people who took part, particularly Cathy and Derek, who travelled all the way from Reading. Judging by the positive feedback, there will be more bio-blitzes to come! Join our Bio-blitz on 5th October! 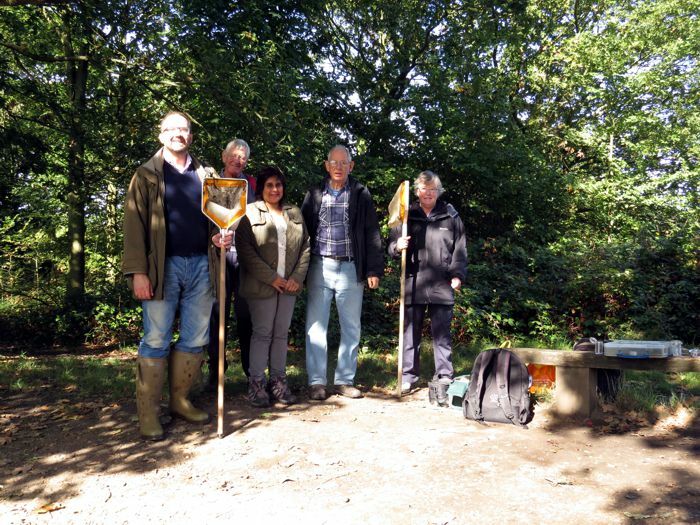 On Sunday 5th October we will be conducting a bio-blitz in Wanstead Park. This is a fun activity, but with a serious aim, as we try to find as many species as we can – birds, insects, spiders, plants and anything else we can come across. Identification guides will be at hand and anything we get really stuck on we’ll photograph for later identification. 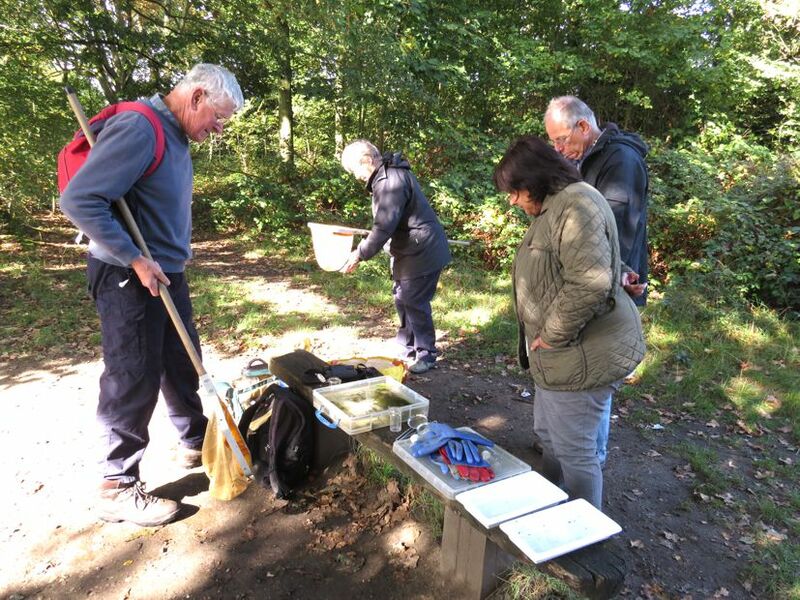 We hope to have a team searching in the leaf litter in Chalet Wood, another group identifying invertebrates on The Plain, and other people counting water birds on the Park’s lakes. If we have enough people we might also have a team working in the Old Sewage Works. Simultaneously, a group of birders will be logging visible migration on Wanstead Flats. If the weather is fine the previous night a moth-trap will be run locally, and interesting moth species will be shown in The Temple. If the weather is poor we may have to change our plans. To help us plan for the event, could anyone wishing to participate please contact Tim Harris (email: tharris@windmillbooks.co.uk or phone/text 07505 482328).